Wild Cherry’s 1976 Hit “Play That Funky Music” synched to the death metal cover by Ten Masked Men. Spotted by my sister, Jenni. 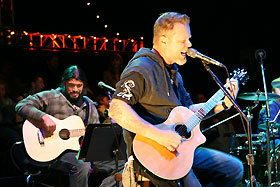 I’m loving the two acoustic gigs that Metallica played at The Bridge School Benefit, Mountain View, CA a couple of days ago. The gigs are now available at LiveMetallica.com with proceeds going to charity. Highlights include a rendition of Dire Straits’ Brothers In Arms and an acoustic arrangement of Disposable Heroes. I typed my username into the login box. “Is that the same email address that you had when you were a student here?” he asked. “You’re not that old!” he exclaimed. But the truth is: I am. The World Wide Web was invented at CERN by Tim Berners-Less and launched on 30 April 1993. I graduated in July 1993. I didn’t get my first email address until 1997, when I began my MTh in Ministry at the University of Edinburgh: [email protected]. Just found this Google maps “mash-up” showing the location of the San Diego County Fires as well as information about evacuations, rescue centres and whether the water is safe to drink or not. Isn’t the internet great! … and fire really dangerous.